We get a lot of questions from our readers, but the most common is “I’m coming to the Canadian Rockies with my family, what should I do”. Here is our opinion on a good family trip in the Rockies. Plan to fly into Calgary and fly-out of Edmonton, if you can get a good deal to leave your car there. If it’s too expensive then fly in and out of Calgary. Your drive back from Edmonton is only 3 hours on a major highway. Plan to take at least a week on this tour. We don’t list a day-by-day itinerary, as some families go from dawn to dusk while others take longer. Either way, coming to the Rockies means getting out and seeing nature, and our best-of list is chock full of family friendly hikes and there is a lot to see. Where you stay depends on what is available and what your budget it. Banff, Lake Louise and Jasper are booked up most of the summer, so plan well in advance or don’t be choosey. The accommodations are also expensive in peak summer months, so if you can come outside of mid-June to mid-September you’ll find much better prices. As for types of accommodation, it includes camping, B and B’s, motels and luxury hotels. We recommend 2+ nights in each of Banff/Canmore, Lake Louise and Jasper. 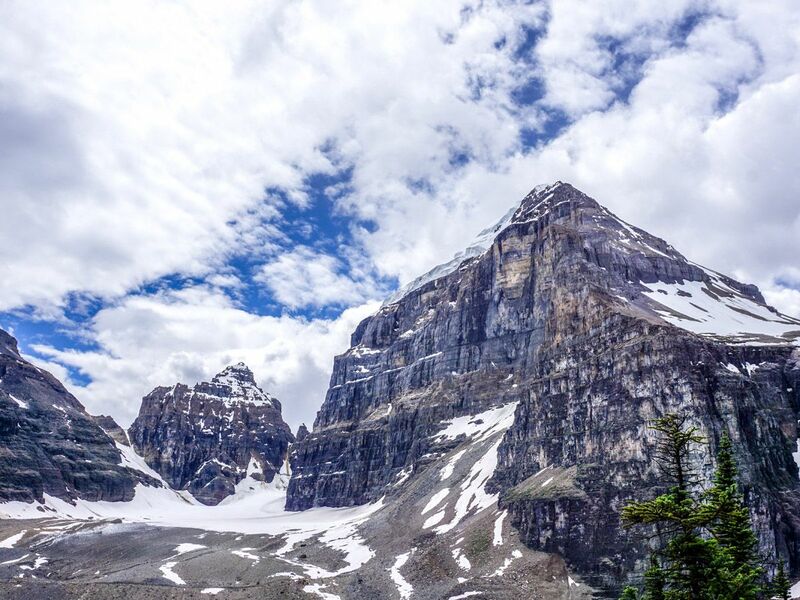 Upon landing in Calgary, rent a car and consider an alternate route to the Canadian Rockies. 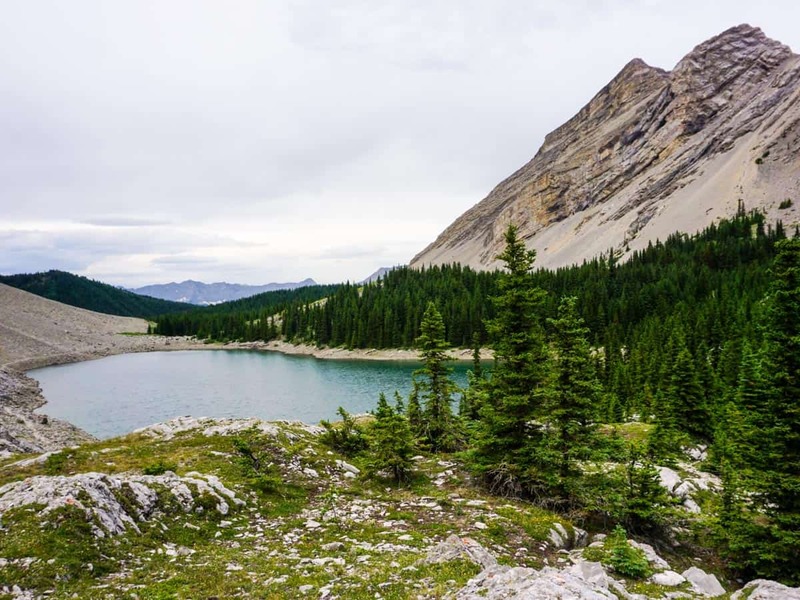 While most people head out of town on the Trans-Canada highway, get away from the crowds and explore a beautiful, and far less visited, area known as Kananaskis Provincial Park. To see Kananaskis with a complete drive on the Kananaskis Trail (Highway 40), don’t take the normal route out of town on the Trans-Canada highway. Instead, you’ll go south through Calgary to Longview. While you’re in Calgary pick up supplies for a picnic, as you’ll be in the wilderness soon. Once in Longview, take Highway 541 going west. Highway 541 soon turns into Highway 40 and heads north and you enter Kananaskis Provincial Park, a more rugged set of mountains then what you find in Banff National Park. Depending on your family’s skill level there are two great hikes you can stop at along the way. First of all, Picklejar Lakes is a 10.5km hike, a good challenge for children 10+. An easier option is Ptarmigan Cirque, a 3.5km walk that regularly sees 4 year-olds. Now’s also the time to break open the picnic! With a name like Picklejar Lake, you can’t NOT pack a picnic on your hike. Continue on Highway 40, stopping off at Kananaskis Lakes. Upper Kananaskis Lake has a long hike, but you can just go to Upper Kananaskis Day Use Area for a wonderful view. There is lots of camping around here, and it’s a good base. If you aren’t camping, continue on Highway 40 until you reach the Trans-Canada highway, where you go west towards Banff and Canmore. You first pass through Canmore, a mountain town that is usually a lot cheaper than Banff. 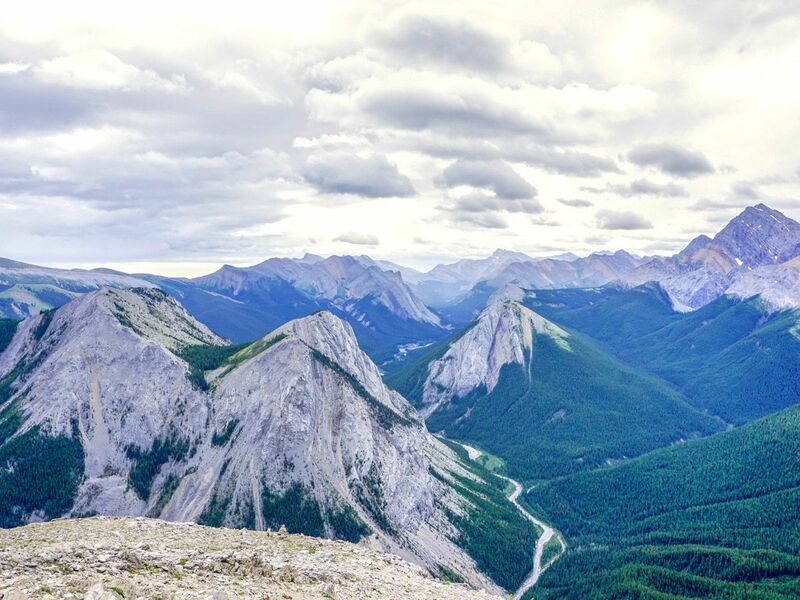 We really like Canmore, and there are some great family hikes in the area. That said, most people continue on for 15 minutes and stay in Banff, where you have everything from camping to luxury hotels. Once you’re checked in, head out and do the Banff Springs Hotel walk, or walk up Tunnel Mountain from Downtown. Check out downtown Banff and visit one of their great restaurants. 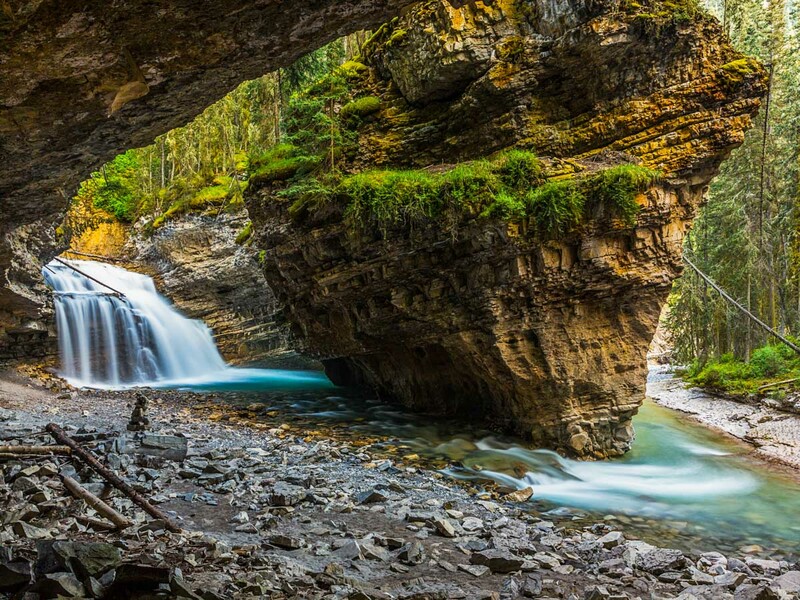 From Banff, get up early and visit the ever-popular Johnston Canyon. While the full route is 12.5km, many people just do the first 2-3km, and it is suitable for kids as young as 4, but remember to hold their hand. A true highlight of the Rockies is a visit to the gorgeous Sunshine Meadows. 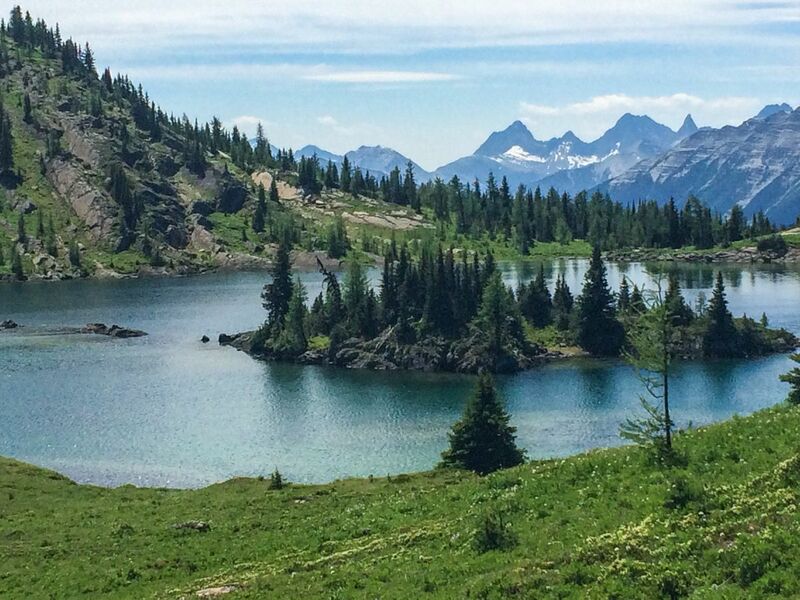 Head up to the Sunshine Village Ski Hill and then up the Standish Chair for a walk down down to the very pretty Rock Isle Lake. From there you can continue exploring other lakes or walk back. From Banff, take the Bow Valley parkway (Highway 1A) to Lake Louise. This is a slower road, but you’re much more likely to see game. Once in Lake Louise, you’ll appreciate the beauty. You’ll need to do a walk around Lake Louise itself, with stunning glaciers at the end of the lake. We recommend the Plain of the Six Glaciers for older children and Lake Agnes & the Little Beehive for kids who are 8+. 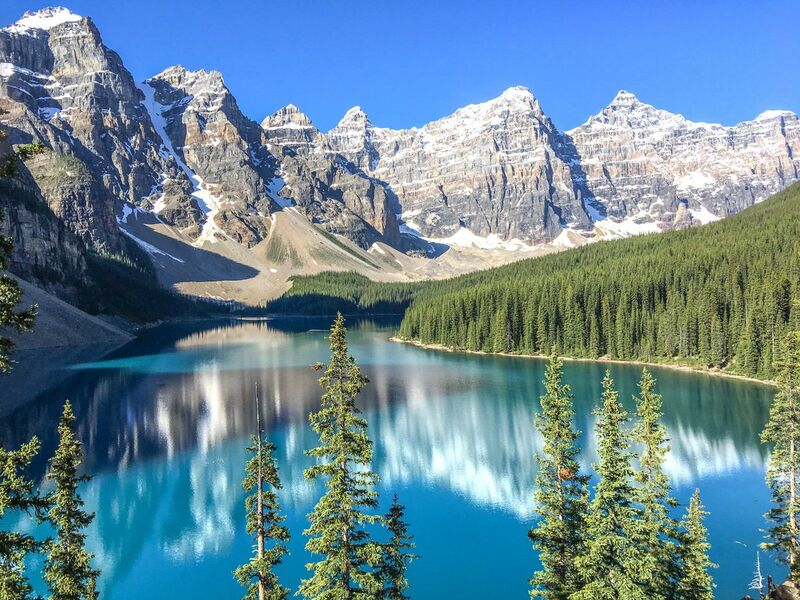 The highlight of the Lake Louise area is a visit to Moraine Lake. With Moraine Lake you’ll want to try going either first thing in the morning (before 6am) or after dinner to avoid crowds. This is an easy hike around the lake, and 5+ year olds can follow the path up the Rock Pile for the iconic viewpoint we know so well. PS – don’t climb the rocks! There’s a trail behind that is much safer. From Lake Louise you can also head out to Emerald Lake. Walking around Emerald Lake is nice and form there you can go to Emerald Basin with older kids. Takkakaw Falls are quite breathtaking. The kids always enjoy seeing big waterfall, however older kids in good shape will love the Iceline hike too. We saved the best for the end, and that’s drive to Jasper. 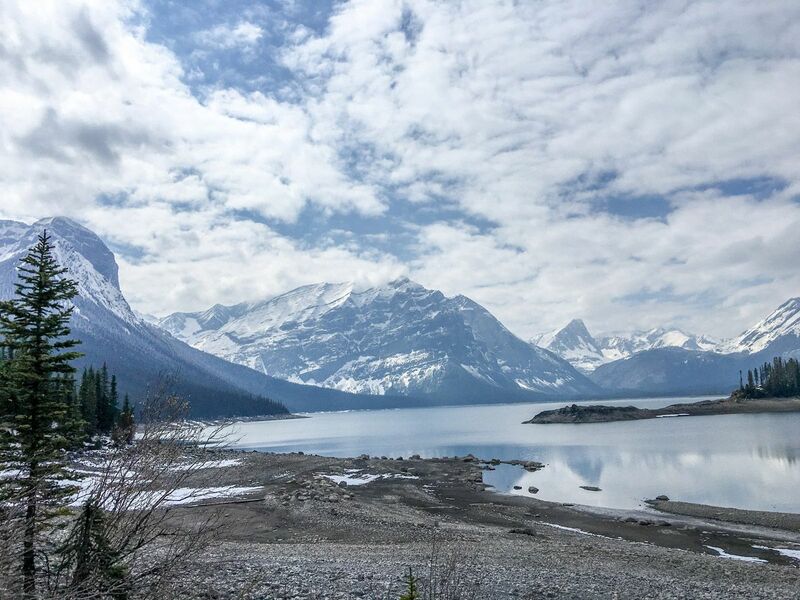 Driving the Icefields Parkway up to Jasper has to be one of the world’s most stunning drives, and we like to stretch that trip out by visiting some short hikes and viewpoints. 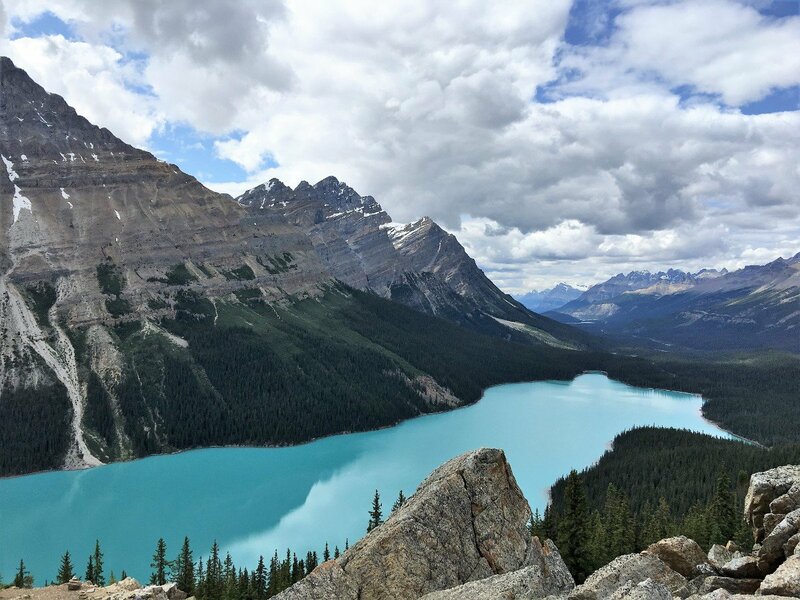 Peyto Lake Viewpoint is a must to and with our hiking guide you’ll be bale to find the secret viewpoint. 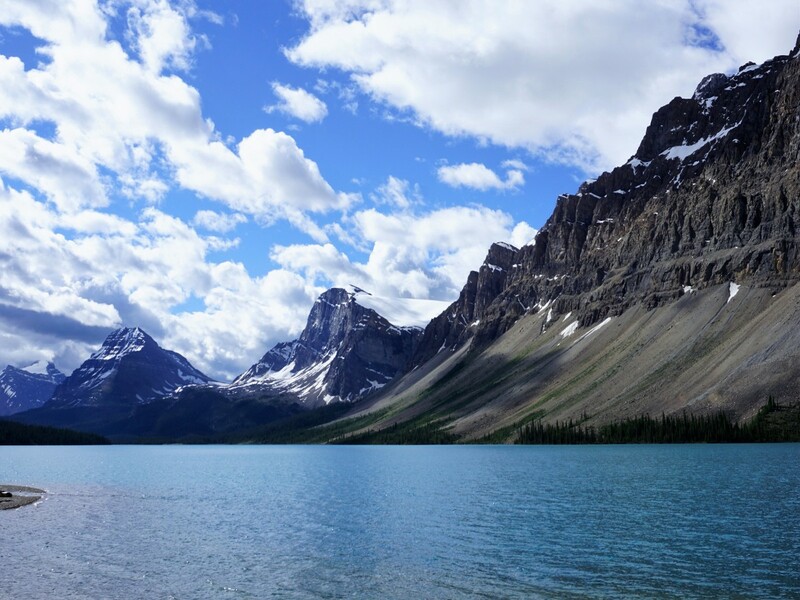 You should also stop at Bow Lake and take in these stunning views with an easy walk around part of the lake. Farther on you come to the stunning Parker Ridge, which is a great hike for children over 8. Finally, if you don’t have time or money for a bus tour on the glacier, consider a wonderful walking tour nearby, the Toe of the Athabasca Glacier hike is free and suitable for children 3+. There’s not much accommodation on the Icefield Parkway, so you’ll likely continue on to Jasper, another great mountain town. Once you’re in Jasper you can find loads of great family hikes. 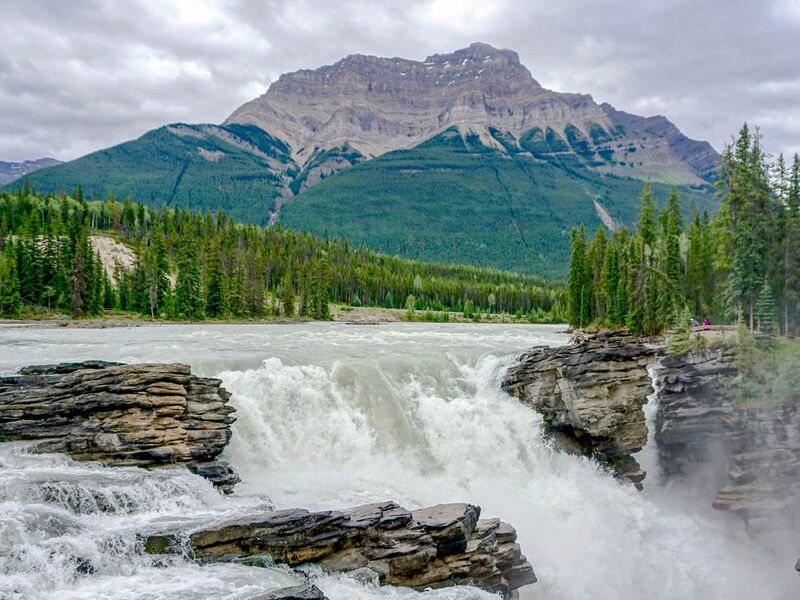 Families with young children can wander the shores of Maligne Lake or explore Athabasca Falls, Maligne Canyon, and Pyramid Lake just above town. We love Cavell Meadows, which is unfortunately closed in 2018. You can also take the tram and explore Whistlers Mountain. On your drive to Edmonton, you need to stop off at Miette Hot Springs, also home to the Sulphur Skyline hike, which has one of the best views in Jasper. This is a tough hike for kids, and only suitable for 10+, as there is 660m of elevation gain. Soaking in the Miette Hot Springs after a hard hike is a great end to your trip and reflect on the highlights of the Canadian Rockies and where you’re next adventure will be!